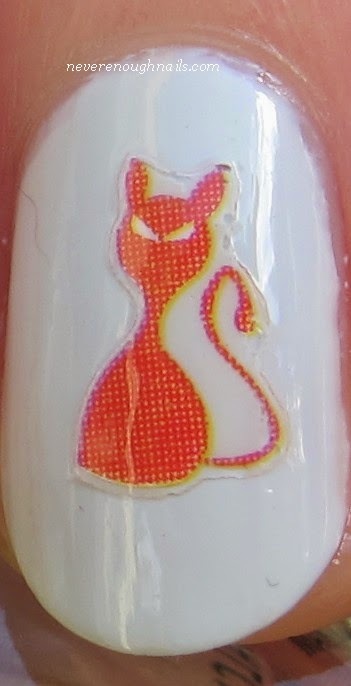 I am pretty much making it my mission to acquire all of the cat-themed nail art supplies available at Born Pretty Store. 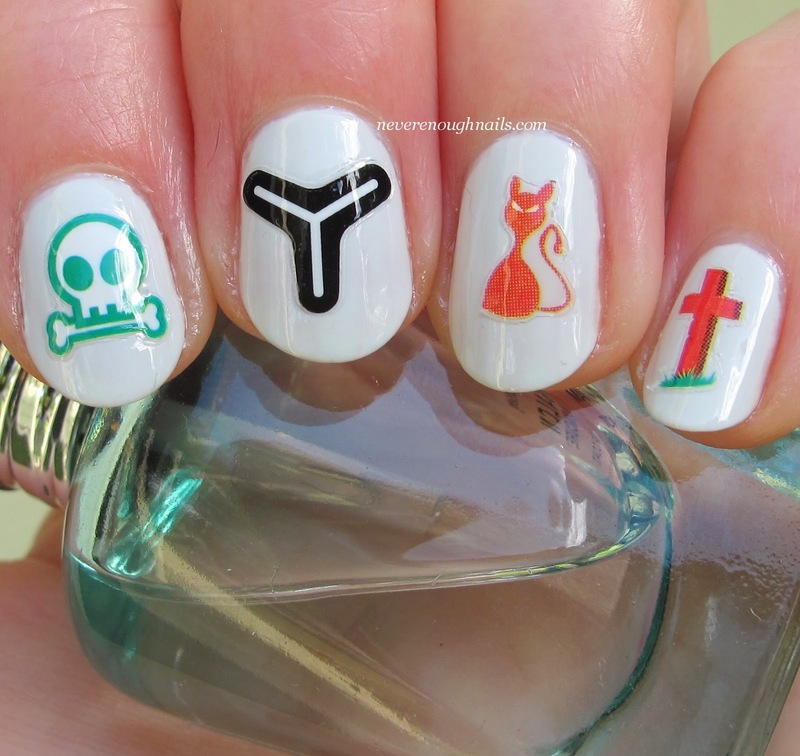 I am a card-carrying Crazy Cat Lady and I do love to have cats on my nails. I recently saw this new sheet of nail stickers featuring cats AND skulls (another favorite nail theme) and knew I had to have it. This sheet of stickers offers both large and small cats in red, green, black, pink and blue, two different kinds of skulls in red, black and green, a couple of crosses sticking out of grass (grave markers? Or am I being morbid?) and some weird 3-pronged boomerang looking items (as seen on my middle nail). I really bought this sheet for the cats and skulls and kinda wish it only had cats and skulls, but for $1.69, I still feel like I got my money's worth. As you can see, I really went for an authentic cat lady feel to this mani and accessorized with some stray black cat hairs. I apologize for those- Binx went to the vet for his yearly check-up/shots today and he is still massively stress shedding. Poor baby! The vet said he is doing great and she admired how gorgeous he is though, so that's good! Anyway, these stickers were super easy to use. Just peel off the sheet, stick on your nail and finish with a layer of top coat to seal them in. For this look, I used OPI My Boyfriend Scales Walls as my base color. If you're looking for cat-themed nail art supplies, Born Pretty Store has you covered. 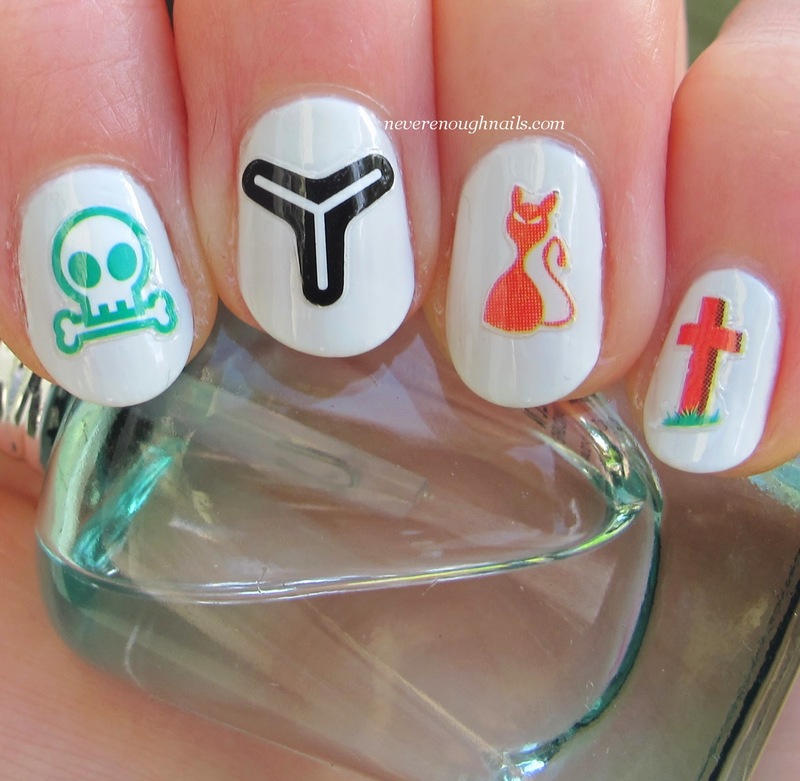 These cute stickers are perfect for the crazy cat lady (like me) and also would be great for a Halloween mani (black cats and skulls!). It is never too early to start purchasing items for Halloween manis, or just Halloween in general. You can find these stickers here (they are item XF475) and don't forget to use coupon code ERJ61 at checkout for 10% off your order. Haha maybe I'll appreciate the grave marker more around Halloween Ananka! Sometimes I feel like some of the nail art supplies throw random stuff like that in with cute stuff. Oh well, it's still worth it!